Our Variable Star of the Season  series returns from hiatus with a long-neglected astronomical gem: RR Lyrae, the prototype of one of the most important classes of variable star in astronomy. RR Lyrae and the class of pulsating variable stars that bears its name had a profound influence on astrophysics of the 20th Century, and it's likely that our understanding of both the size and nature of our Universe would be far more incomplete without these important stars. RR Lyrae itself is a variable easily within view of most northern observers with modest telescopes or binoculars, and yet it remains a target for major observatories and research programs. Both its visual prominence and its historical stature make it a fitting target for the September 2010 Variable Star of the Season. Harvard College was a hive of variable star activity in the late 19th century. The director, Edward Charles Pickering, and his extensive staff of "computers" -- women who carefully conducted many of the tedious calculations or searches of photographic plates at the observatory -- released dozens of papers and catalogues detailing their efforts in stellar cartography and photometry, asteroid searches and photometry, and variable stars. One of these was a short paper in Harvard Circular Number 29 (1898) describing a simple technique for the study of short period variables. In it, Pickering describes a technique for obtaining multiple photographic exposures of a star in a short amount of time -- a primitive but effective form of time-series photometry. A photographic plate was alternately exposed and covered over preestablished intervals in a telescope whose alignment and tracking rate were not precisely aligned with the sky. The result is that multiple exposures of a given star were obtained during an evening's observing, and that the periods for short stars might be more efficiently obtained. A 1901 Astrophysical Journal paper by Pickering provides a list of sixty four new variables, one of which -- a star in the constellation Lyra -- was found using the method above on a plate from July 13, 1899. Examination of this plate by one of Pickering's staff, Wilhelmina Fleming, revealed a short-period, high amplitude star. The star, with a range of more than 3/4 of a magnitude and period of just over half a day, clearly resembled those of the cluster variables (also discovered by Fleming in her analysis of plates from Solon Bailey's cluster survey in 1893). Regular observations of this brightest "cluster variable" of the field commenced at Harvard as well as at other major observatories including Lick and Mt. Wilson. RR Lyrae's brightness (between 7th and 8th magnitude) made it bright enough to observe spectroscopically in such a way that the changes in its spectrum could be traced throughout its cycle of variability. This enabled astronomers to measure changes in spectral type, as well as to detect the presence of emission lines. In his comprehensive 1916 review paper on RR Lyrae, Harlow Shapley made it clear that the binary hypothesis for variations in the "Cepheid variables" (with which he included the cluster variables) was inconsistent with both the spectroscopic and photometric variations; spectra suggested that the "orbits" of these binaries would have to be unphysically small, which photometry showing variations in the rise time to maximum required unphysical variations in the hypothetical orbital parameters. Shapley also noted an important fact about RR Lyrae using the observations of Harvard's Oliver Wendell as well as his own: the times of maximum and the shape of RR Lyrae's light curve varies in a cyclical way with a period of around 40 days. This effect, later known as the Blazhko Effect, has continued to provide a puzzle for astrophysicists to the present day. Although RR Lyrae was not the first "RR Lyrae star" discovered -- both the cluster variables and the two field stars U Lep and S Ara came first -- RR Lyrae is by far the brightest, and its brightness made it an easy target for both photometrists and spectroscopists. The name RR Lyrae variable subsequently became a fitting title for this important class of stars. The RR Lyrae are members of an elite class of pulsating variables known as instability strip pulsators. These stars, all confined to a narrow region of the Hertzsprung-Russell diagram, pulsate for the same reason: pulsations are driven by radiation being partially blocked from escaping the star, and the resulting increase in pressure and temperature makes them expand. When gravity makes them contract again, the cycle repeats. Due to the physical properties of stars and stellar interiors, only stars with very specific physical properties can do this, and those that can lie on a narrow diagonal strip of the H-R diagram running from hot, blue, and faint stars at lower left, to cooler, redder, and brighter stars at upper right. Where this strip intersects a common population of stars within the H-R diagram is where you'll usually find pulsators. Where it intersects the white dwarf sequence, you find the ZZ Ceti (DAV white dwarf) stars. Where it intersects the main-sequence, you find the delta Scuti stars. Where it intersects the post-main sequence, you find the Cepheid variables and W Virginis stars. And in low-metallicity stellar populations, where it intersects the horizontal branch is where you find the RR Lyrae stars. The RR Lyrae have intermediate luminosities between those of the (brighter) Cepheids and (fainter) delta Scuti stars. 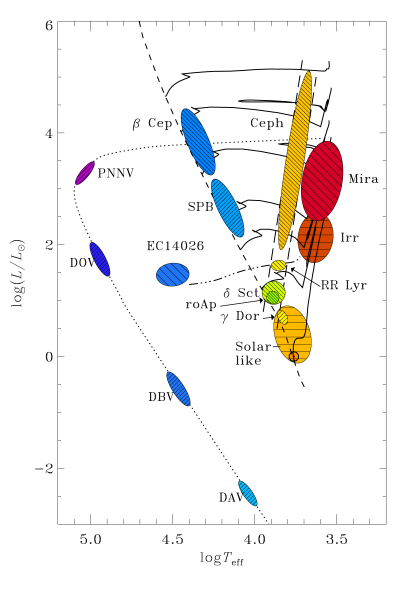 The RR Lyrae stars are very evolved members of lower-metallicity stellar populations. They have evolved through the main sequence, burned all of the hydrogen in their cores, and then made one quick run up the post-main sequence red giant branch and settled back onto the horizontal branch -- a short period of a low-metallicity star's life where it burns helium in its core and hydrogen in a shell around the core. RR Lyrae stars are subgiants, more luminous than our Sun, but less luminous than the Cepheid variables. Globular clusters with well-defined horizontal branches can sometimes have significant numbers of RR Lyrae stars in them, a fact that we can put to very good use here on Earth. RR Lyrae stars are astrophysically interesting in their own right, but what makes them most interesting is how they can be used. Another of the Harvard computers, Henrietta Swan Leavitt, was largely responsible for discovering another peculiarity of stars on the instability strip. Leavitt studied the Cepheid variables in the Small Magellanic Cloud, measuring their apparent magnitudes and their pulsation periods. The Small Magellanic Cloud was an important target because it was (correctly) assumed that all of the stars in the Cloud were physically associated, and were at approximately the same distance from the Earth. By 1912 Leavitt established a clear relationship between the apparent brightness of these Cepheid variables in the SMC and their pulsation periods -- the brighter the star, the longer the period. Further, it was a very tight and well defined relationship. You could estimate with very good accuracy how bright a Cepheid would be given its period and vice versa. The PL relation for Cepheids in the SMC, showing magnitude on the y-axis versus log(Period, days) on the x-axis. From Leavitt and Pickering 1912 (Harvard Circular 173). This was an amazing discovery because of what it implies: (a) if the period-luminosity relation is universal for all stars, and (b) if you can find some way of calibrating the relation using Cepheids of known distance, then you can use Cepheids and other instability strip pulsators to measure distances. Astronomers were soon able to calibrate this relationship using nearby stars with distances known by parallax, and they indeed confirmed that the relationship between period and luminosity was real and universal. This relationship, known as the Period-Luminosity relation, was critically important to our eventual understanding of the nature and size of the Milky Way and of the size of the Universe. Harvard Astronomers Solon Bailey and Harlow Shapley were major players behind the adoption and use of the cluster variables as distance indicators. Shapley was himself a participant in The Great Debate of 1920 between himself and Heber Curtis on the topic of the size of the Milky Way and the nature of "spiral nebulae" (now known to be other galaxies like our own). Much of the argument centered on the globular clusters -- their distances and location within the Milky Way. Parts of Shapley's arguments hinged both upon the distribution of globular clusters, and their distances from us. The cluster variables -- mostly RR Lyrae stars -- were used as "standard candles" to measure the distances to the globular clusters, and so provided us with a first glimpse of the true size of the Milky Way. The relationship between a pulsator's period and its luminosity is know known as the Leavitt Law. It has been used to measure everything from the distances to Cepheids, RR Lyrae, and delta Scuti within the Milky Way, to measuring the distances to galaxies nearly 100 million light years away. It is still used today as a measuring tool in the cosmos, and there are constant efforts to better understand and refine this relation for all of the individual classes of stars on the instability strip. In 1907 the Russian astronomer Sergei Blazhko first noticed the modulating amplitude of RW Draconis' pulsation light curve. Unlike other similar pulsators, its light curve wasn't regular from cycle to cycle, but changed in both amplitude and shape in a regular and predictable way. This effect came to be called the Blazhko effect, and was soon discovered in many other high-amplitude RR Lyrae stars (those of type RRab). 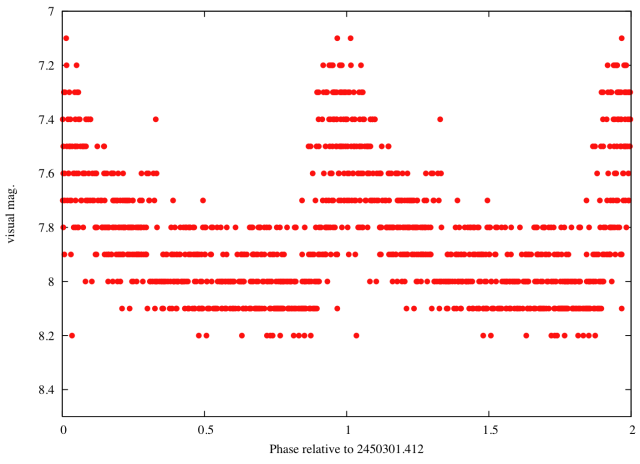 The class prototype RR Lyrae was itself found to be a Blazhko star by Harlow Shapley, with a Blazhko period (the time it takes to go through one Blazhko modulation cycle) of about 40 days. Thus the brightest of the RR Lyrae stars also has this peculiarity in pulsation. One might assume that since the Blazhko stars have been known for so long and include the brightest member of the class that the effect would be well understood by now, but this curious phenomenon has remained mysterious to the present day. A number of explanations exist and great progress has been made very recently, but a definitive cause has yet to be proven. What are some ideas? One of the earliest hypotheses was that the Blazhko stars were multimode pulsators in which the main pulsation -- the radial fundamental mode -- was interacting with one or more weak non-radial modes to create the beating pattern of the amplitude modulations. Some additional refinements to this included the addition of rotation, and a non-linear interaction between the pulsation modes. Another possibility was that there are magnetic cycles within these stars similar in nature to the 11-year solar magnetic cycle but on a shorter timescale. Further refinements to that theory include the idea that the rotation axis of the star is not aligned with the magnetic poles, that there's an interaction with magnetic fields and convection, or perhaps some combination of all of these. Work by Chadid et al suggests that magnetic fields are probably not the cause of the Blazhko effect; she and her collaborators found that RR Lyrae itself has no strong magnetic field (at least above a limit of 80 Gauss), and so its Blazhko effect must be due to something else. However, no one theory has been proven beyond a shadow of a doubt. The Blazhko phenomenon remains a major topic of research for the stellar variability community, and there are several major facilities (including the CoRoT satellite shown here) spending time observing these stars. Where is the field headed? Right now, there are two things needed to make good progress: very high precision photometry, and high-resolution time-series spectroscopy. The high-precision photometry will aid researchers in accurately measuring the shape of the light curve, and in Blazhko stars every small bump and wiggle can have significance. Ground-based photometry at the level of a few millimagnitudes of accuracy is still being collected and used, but the micromagnitude precision and gapless coverage offered by satellites like CoRoT and Kepler may provide important new clues of their own. Indeed, Szabó et al. (2010) may have found an important clue to the Blazhko effect using ultra-precise Kepler observations of half a dozen stars. They suggest that "period doubling" caused by a resonance of two pulsation modes may be responsible. Period doubling, where there is apparent variation at twice the actual period, is seen in RV Tauri and (sometimes) W Vir stars, although in those cases it produces much greater irregularity. Likewise, large ground-based telescopes with high-resolution spectrographs are also being turned toward these stars, most notably RR Lyrae itself. As Geza Kovács noted in his 2009 review, "...accurate time-series spectral line analysis [will] reveal any possible non-radial components and thereby let [us] include (or exclude) non-radial modes in explaining the Blazhko phenomenon." Why is this? A non-radial pulsation means that the star is not pulsating in spherical symmetry -- different parts of the star's surface are moving in and out at different times, and the shape of the surface depends upon the type of mode that's pulsating. Since different parts of the star are moving in different directions at different speeds, and this may appear in a spectrum of the star as asymmetries in absorption line profiles. An absorption line in a stationary gas will have a line profile that is similar to a Gaussian -- symmetric, with one central peak. But if different parts of the star are moving at different speeds relative to our line of sight, then each parcel of gas will have its own red- or blue-shifted line profile resulting in a single line profile with waves and bumps. These features may also shift around in wavelength if the star is rotating. Careful analysis of the changes in line profile with time may reveal the presence of non-radial modes, or it may eliminate the possibility. As those of you doing spectroscopy know, it's much easier to obtain a spectrum of a bright star, and the higher the resolution of the spectrum, the longer it takes to get good signal-to-noise. That's as true for a spectrograph on a major ground-based telescope as it is for the one on the C11 in your backyard. Since RR Lyrae is the brightest Blazhko star of the bunch, it remains an important target for both spectroscopic and photometric observations by the research community. In particular, RR Lyrae was a primary target for the Blazhko Project  of the University of Vienna, and the star has been a target for several collaborative observing programs by Horace Smith of Michigan, Katrien Kohlenberg of Vienna, and many other collaborators. Although it is not formally one of the target stars of the AAVSO's Short Period Pulsators Section  (nor of its predecessor, the AAVSO RR Lyrae Committee), the AAVSO has over 8500 observations of RR Lyrae, about half of which are visual, and the other half are from intensive CCD time series by two observers. The AAVSO has small stretches of visual observations, typically one season by one observer, between 1976 and 1995 from which visual times of maximum (TOMs) can be derived. Starting in 1995, the AAVSO's visual community began observing this star in earnest, and there are a number of cycles from which TOMs can be derived up to and including the present day. Data for RR Lyrae dates back well before the AAVSO archive however; you can find some of these data archived at the GEOS RR Lyrae database . Phase diagrams of RR Lyrae using AAVSO data: (left) Visual data, JD 2450200-2450400; (right) V-band data, JD 2453941-2453992, where different colors are different cycles. 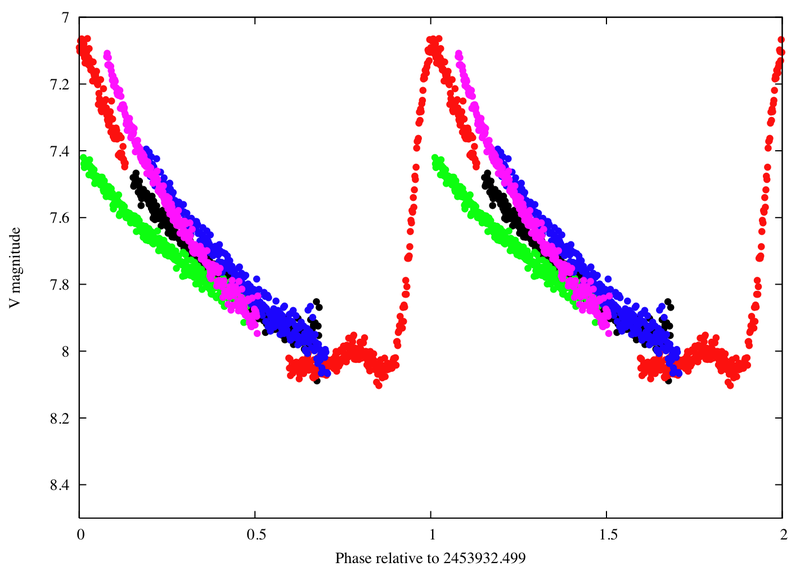 The RR Lyrae research community has shifted away from visual observations to the use of CCD timings, since they allow higher time and magnitude precision and can reveal finer details in the behavior of RR Lyrae star timings than can visual data. While the complex problems of RR Lyrae astrophysics require instrumental observations for TOMs and for light curve analysis, RR Lyrae remains an enjoyable visual target with minute-to-minute changes sometimes visible during the rising branch of the pulsation. The AAVSO Sequence team has recently updated and expanded the sequence; visual observers should use B-scale charts and observe with a wide-field instrument like binoculars or a low-power telescope. Instrumental observers should have a number of comparison stars to choose from within the field, but comparisons comparable in brightness to RR Lyrae itself (between V=7.2 and 8.2) will produce optimal signal-to-noise. As with visual observing, a wide-field camera will provide the greatest range of comparison stars. As always, we encourage instrumental observers to fully reduce, calibrate, and transform their observations, including airmass corrections and transformation to a standard system. This will make it much easier to combine your observations with those of other observers. RR Lyrae is an understated gem among the variable stars in the AAVSO archives. While there are many RR Lyrae stars actively pursued by AAVSO observers and the research community, RR Lyrae itself remains an important target for modern astrophysicists. More than a century after its discovery, the secrets of this bright northern variable have yet to be fully uncovered. However, there is real hope and excitement within the astrophysics community that the complex problems of the variability of RR Lyrae and other stars like it may finally be yielding to more and better observational data more than a century after its discovery. Our Variable Star of the Season, RR Lyrae, shows the unbroken chain of discovery and understanding beginning more than 100 years ago and stretching to the present day. This Variable Star of the Season article was written by Dr. Matthew Templeton, AAVSO.